As cable and premium channels have cornered the market on prestige television, broadcast networks have scrambled to remain relevant. There is an understandable reluctance among the networks to go all in with prestige. Critical love and award-show adulation is all well and good, but these types of series often don’t attract the large audiences the networks want and need. Smaller audiences mean lower ratings, which means less ad revenue. The safer bet is to produce uncomplicated dramas with broad appeal — milquetoast procedurals like CSI and Law & Order are watchable, disposable products that hit the right audience pleasure zones to keep them coming back week after week even if the content isn’t especially compelling. Recently, the networks have enjoyed success in genre shows. The Flash, Arrow, Gotham, Sleepy Hollow, Agents of S.H.I.E.LD., and Once Upon a Time among many others have all done solid numbers by network standards. These shows can be a lot of fun, but at the end of the day, none of them rise to the level of prestige. Occasionally, a network will stumble upon a unicorn, a drama that is both critically lauded and popular. CBS had such luck with The Good Wife, but that’s really an outlier. For the most part, the networks have been taking a kitchen sink approach to programming for the last couple seasons, trying a little bit of everything and seeing what sticks. In addition to the tried and true procedurals and multi-cam sitcoms, networks now attempt to capture some of that cable cachet with dramas that are more complex and gritty, and even the occasional miniseries. The results have been mixed. As expected, NBC’s efforts feel the most contrived as the network continues to flail trying it all and not doing much well. Hellboy, its foray into comic book adaptation series quickly flamed out, as did much of its fall sitcom lineup and the much-touted “The Slap,” which went largely unnoticed be critics and viewers alike. On the other hand, Fox received a lot of attention for the hip-hop soap opera Empire, which just wrapped a strong debut season last month. ABC, meanwhile, has been doing some interesting work across the board. Both Fresh of the Boat and Blackish have been solid, consistently funny efforts that are literally changing the complexion of the modern sitcom. Shonda Rimes’ takeover of the entire Thursday night lineup was a smart move. Her shows (How to Get Away with Murder, Scandal, Grey’s Anatomy) may be popcorn, but they are damn entertaining, and have been a ratings win for ABC, as well as was the final nail in the coffin of NBC’s once great Thursday night block. If there’s a common thread here, it might be ABC’s willingness to lean in to diversity programming. Rimes, a black woman, has always made a point to demonstrate diversity among her shows’ characters, and has done so without being obvious or didactic. So, too, have its new sitcoms highlighted diversity by showing not telling. It makes sense, then, that American Crime would find a home on ABC. The new anthology drama by John Ridley, the Oscar-winning screenwriter of 12 Years a Slave, is an intense, poignant look at issues of race and class in contemporary American society. The 11-episode first season stars Felicity Huffman and Timothy Hutton as a divorced couple who are forced back into each other’s lives after their son Matt is murdered and daughter-in-law is brutally beaten during an apparent home invasion in the California Central Valley city of Modesto. Emotions run high among characters as the ensuing investigation pulls individuals from disparate walks of life into its orbit. In doing so, the show exposes the subtle and often not so subtle prejudices we all carry with us. As Barb, Huffman is a shrill, volatile character whose experience raising her sons after Hutton’s character gambles away their savings has hardened her to the rest of the world. Her racism is so engrained that her frequent use of “those people” and curt dismissal of a black detective is made even offensive in its casualness. As is her cringe-inducing sense of exceptionalism when she recounts the years she had to suffer the indignities and perceived abuse by minorities while living in government housing. Her lack of compassion for her neighbors and resoluteness in not seeing them as similarly undeserving of such humiliations speak volumes. Even more ugly is the tortured logic Barb uses in her attempt to get the murder classified as a hate crime because the suspect is black. Her eagerness to turn the investigation and ensuing trial into a media circus by playing the (reverse) race card belies her ideologically skewed sense of justice that would be right at home at Fox News. Hutton is the cooler head here as Russ, the flawed but loving father who is willing to face the truth of what happened even as it changes his view of who his son was. His quest brings him into conflict with Barb whose cognitive dissonance prevents her from listening to the truth. He also finds uneasy allies in daughter-in-law Gwen’s strongly religious parents, one of who may know more than he or she initially lets on. The first picture we get of Matt and Gwen paints them as the fairy book couple. He was a proud veteran. She was a literal beauty queen. But that story gets complicated as we learn more about their private life. Complicated is the best way to describe American Crime, which is what makes it such an unlikely network drama. Indeed, everything about this series screams cable drama. The overall feel is cinematic. The pacing is deliberate, never rushed. Scenes dole out information at a trickle, and not always linearly as the show jumps between the various characters. This isn’t a demanding show to watch, but it does require more attention than typical network fare. If you’re one who likes to diddle on your phone while watching TV, expect to be lost. An easy comparison is found in Crash the 2004 Paul Haggis film, in which an incident brings together a similarly disparate group of people and exposes their prejudices with equal rawness. But American Crime is hardly derivative. The episodic format allows the story to unfurl with greater depth allowing us more insight to all perspectives. Three episodes in, this show does not appear to painting in broad black and white strokes. This is a show that operates entirely in gray areas. There is no clear hero or villain in this story — at least not yet. As despicable as Barb is, she has her reasons for why she’s acting this way, warped as they may be. Likewise, Matt and Gwen were not the saints their parents thought they were. Meanwhile, Carter (Elvis Nolasco) — the meth-addicted black man charged with killing Matt — and his devoted girlfriend and fellow addict Aubry (Caitlin Gerard) are at the core of the show’s most sympathetic arc. Together they have a sweetness and love that gives the show some much-needed warmth. American Crime digs deeper into racial politics in by regularly moving away from the white perspective and exploring identity and the fault lines within American black and Hispanic communities as well. Similarly, Carter’s sister Aliya (Regina King) arrives to encourage him to use the trial as an opportunity to call attention to the racial inequities of the justice system. Like Barb, she wants to unleash the media, but for exactly the opposite reasons. For his part, Carter dismisses his Aliya, at least for now, chiding her for converting to Islam to flee from her past life. It all makes for a tense, uneasy hour of television that is also timely as hell. 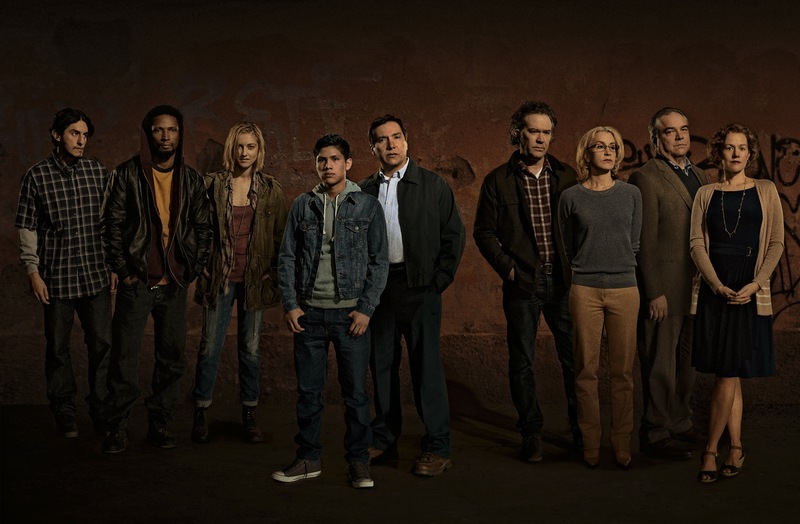 Despite its heavy subject matter, American Crime so far does not preach; rather it presents a solid, compelling story that feels every bit as real as what we’ve seen on the evening news for the past year. Race is an uncomfortable topic, but it’s also one that we too often bend over backward to avoid discussing. More than anywhere else on network television, ABC has proven its willingness to create primetime programming that is an accurate reflection of this country’s shifting demographics. Putting a show like American Crime in primetime is a bold choice both in style and content. Too often, we use television as an escape, a respite from the ugliness of the real world. While that’s not necessarily a bad thing, I can appreciate when a show like this invades that precious oasis and dares to make us uncomfortable. American Crime airs on Thursday at 10 p.m. on ABC. Catch up on previous episodes on Hulu Plus or your on demand service.